More valentine posts, are you sick of them yet? This one involves sugar so you can't be too mad. This homemade version of the beloved childhood treat were made for my sweet galentines. I wanted to bake my gals something sweet, but something different. 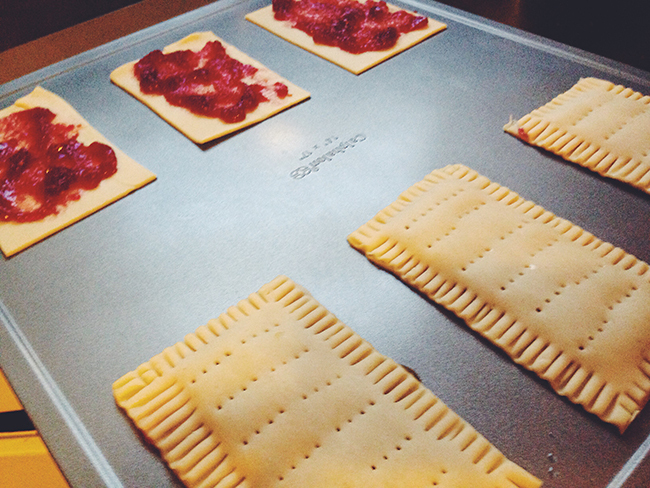 I'm pretty pleased with how these pop tarts turned out, not to mention they are supa easy. They also took my back to my D.C. days getting homemade pop tarts at Ted's Bulletin. Store-bought pie crust, jam and icing. Not usually my style to go the store-bought route, but in this case it totally works. Take one sheet of pie dough and roll it out a little thinner than it comes packaged, this will give you more area to cut-out from. Using a pizza cutter or a knife cut out your rectangles. In the picture above you can see how I managed this. Let me tell you, it's hard cutting rectangles from a circle surface area, but with some precision you can get about 6 rectangles from what you are working with. Lay these out on a greased or parchment lined cookie sheet. Spread a small tablespoon of jam on each piece of dough, making sure you don't get too close to the edges. Now it's time to roll out your next pie dough and cut 6 more rectangles. Before you layer these on top, beat an egg and brush the whole rectangle with the egg wash. This will act as glue to keep the top and bottom pop tart layer together. Using a fork, crimp the edges together and pierce the top. Finish rolling and cutting your dough, filling with jam and assembling your tarts onto cookie trays. **Make sure and save your scraps of crust to bake! I sprinkled mine with cinnamon sugar and my roommates and I happily gobbled them up! Preheat your oven to 350 degrees. 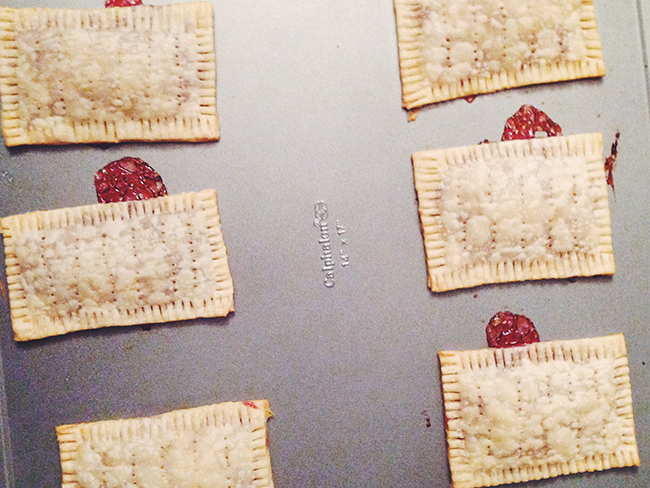 While your oven is preheating, place your cookie sheets of pop tarts in the fridge to firm up. Bake for 15-20 minutes or until the edges are just golden brown! 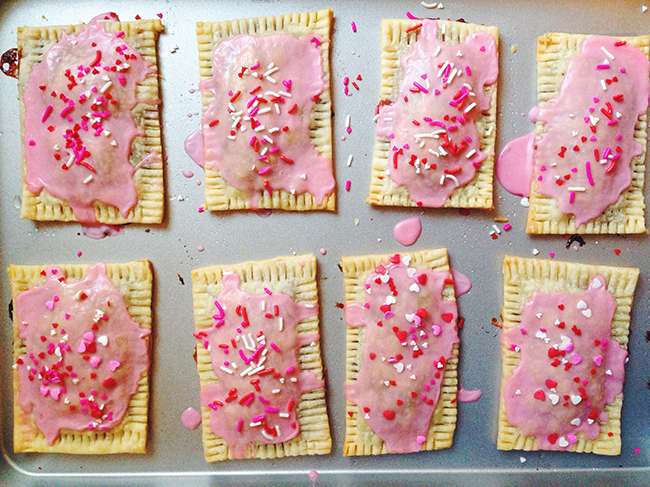 While your pop tarts are cooling, it's time to make the icing. Whisk up the powdered sugar, milk, vanilla extract and food coloring if you choose. Using a spoon, spoon on a small amount of icing and spread it over the center area, my icing had a mind of its own and spread everywhere, but hey, it's "rustic" right? Decorate with sprinkles and you now have the cutest treat ever! **Tip- pop them the toaster oven or microwave before eating! 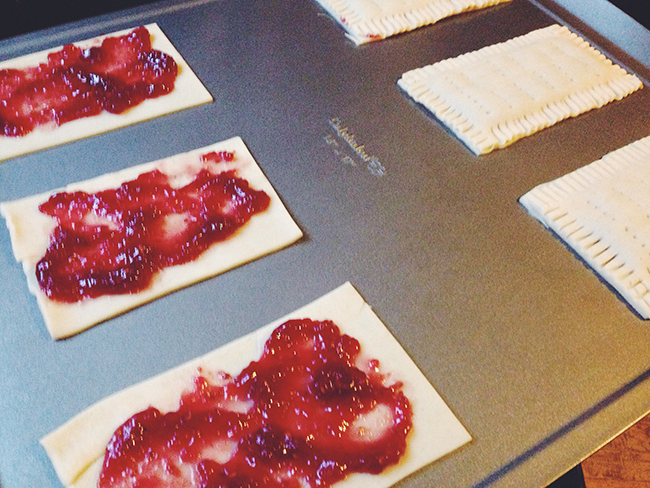 This list of directions is a little long, but these pop tarts are actually very easy! These little guys were so fun to make and even more fun to giveaway to my girlie friends. Like I said, they are fairly simple so if you are in a bind and in need of a last minute valentine treat, these should fit the bill! Stay tuned tomorrow for a DIY on how to package up these pretties!